Readers of Digital Spy have voted The Day Of The Doctor Best Drama Of 2013 with 35.7%. Breaking Bad was second with 18.1% and Broadchurch was voted third with 12.1%. Also Best TV Actor was David Tennant with 29.7% and the runner-up was Matt Smith with 19.6%. (Olivia Colman won Best Actress). The David Tennant voiced radio advert for Heinz Soups has won the November Aerials Award. The Guardian lists Broadchurch at number 5 in their Best TV Of 2013. The Hollywood Reporter has the details of Kevin Zegers character's backstory plus the RUMOUR of 2 more Gracepoint cast (In Treatment�s Dan Futterman and Anya Epstein). The Telegraph lists Broadchurch at the top of its Ten Best TV Shows of 2013, plus the page has a poll to vote. 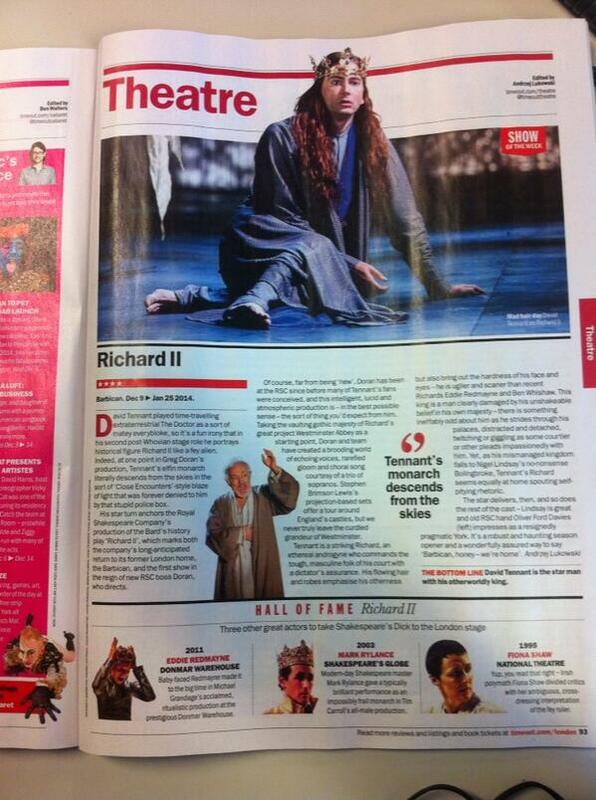 Richard II is currently winning the What's On Stage Award for Best Regional Production with 30% of the vote. Broadcast lists David Tennant at #7 in their list of Top TV Talent For 2013. Olivia Colman is #1, Mel and Sue (from Great British Bake-off) are #2 and Peter Capaldi is #3. Richard II at the Royal Shakespeare Theatre, Stratford-upon-Avon has been nominated for the Best Regional Production Award at the What's On Stage Awards. Voting is now open at this link. Doctor Who News reports that The Day Of The Doctor took a stunning $4.8 million at the US box office on Monday (equivalent to �3 million) making it the number two movie of the day. Digital Spy have a new 4 minute video interview with David Tennant and Matt Smith about The Day Of The Doctor. The Telegraph says that the characters Ellie Miller and Susan Wright will retain their Broadchurch names but David Tennant's character in Gracepoint will be called Emmett Carver. TVLine reports that Breaking Bad's Anna Gunn will star with David Tennant in the US remake of Broadchurch, Gracepoint. Doctor Who Magazine have posted details of their 50th Anniversary edition of Doctor Who Magazine (issue #467) which is published on 14 November. 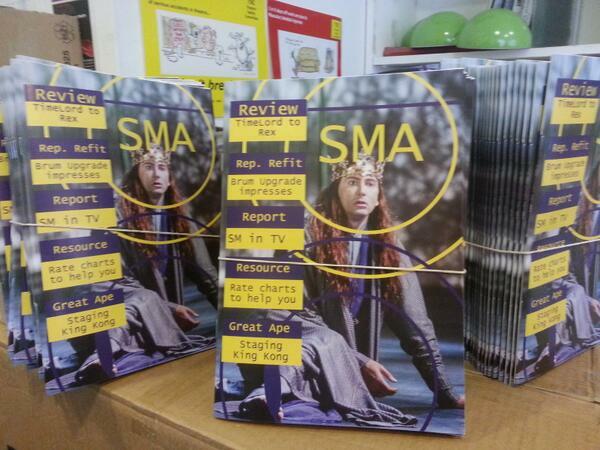 The magazine will have an interview with David Tennant and Matt Smith interviewed together. Channel Four News article with extracts from their David Tennant interview to be broadcast tonight. Channel Four News has posted an 18 second clip from their interview with David Tennant to YouTube. The Hollywood Reporter visited the set of The Day Of The Doctor. At midnight The BBC released interviews with several cast members (including David Tennant) about The Day Of The Doctor. 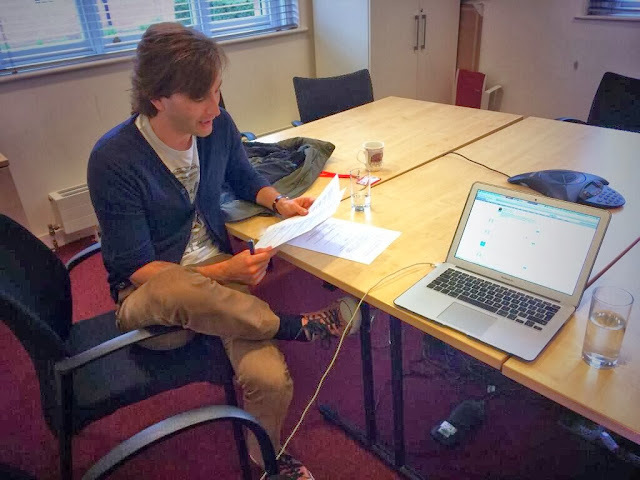 The Guardian Stage online chat lasted about forty minutes and then David Tennant had to dash off for a Channel Four interview. The Dum reports that David Tennant has returned to Virgin Media adverts. Radio Times reads Chris Chibanll's tweet to us as refuting that Olivia Colman is signed up for Broadchurch Series Two. The Crime Vault has reported that Little, Brown Book Group has bought the rights to a novel inspired by the first series of Broadchurch. It will be written by Chris Chibnall and psychological thriller author Erin Kelly. Daily Mail (scroll down slightly) says that David Tennant will be in second UK series of Broadchurch and that it will be set elsewhere. This has not been confirmed yet. However it is already known that Olivia Colman is in the second series and that David Tennant will star in the American remake. 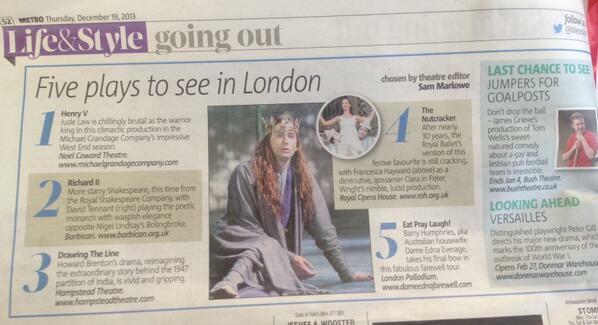 The Escape Artist is The Independent's TV Pick Of The Week. Birmingham Mail has a four star review of Richard II (which contains SPOILERS as it gives away details about how this production stages the plot). The Escape Artist Press Kit has been issued. The press kit includes a new interview with David Tennant. At midnight the embargo was lifted and it was announced that five previously missing Doctor Who episodes of 1967's The Enemy Of The World (episodes one, two, four, five and six) and four of the five missing episodes of 1968's The Web Of Fear have been returned to the BBC archives.